Special malt with high gluten-specific peptidase activity was prepared by germinating barley grain for 8 days at 18 °C and 48 % humidity. Endogenous malt peptidases were characterized and used to degrade gluten in barley wort. Peptidases of aqueous malt extracts degraded celiac-active peptides by cleaving peptide bonds involving proline residues. The peptidase activity was not affected by cultivar, area of cultivation, and high temperatures up to 80 °C during kiln drying. Temperatures up to 50 °C were tolerated without loss of full activity in aqueous solution. The presence of ethanol decreased the activity significantly. 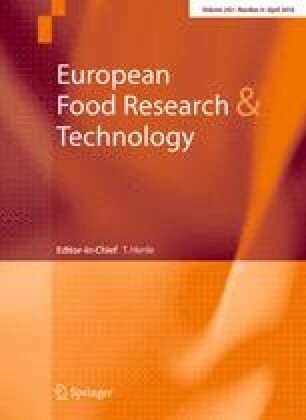 Cross-flow filtration, freeze-drying, and evaporation under reduced pressure at 50 °C were used to produce a concentrated enzyme-active malt extract. The latter method yielded the best results, and the obtained concentrate was used to study gluten degradation in barley wort as affected by concentration of the extract, incubation time, and temperature. The gluten content was determined by a competitive R5-ELISA. The addition of 10 % concentrated extract (grist-to-water ratio 1:2.5; 40.4 °Brix) to wort and incubation for 24 h at 50 °C resulted in a gluten-free wort. Verena Knorr and Roland Kerpes have equally contributed to this work. This research project was supported by the German Ministry of Economics and Technology (via AiF) and the FEI (Forschungskreis der Ernährungsindustrie e.V., Bonn), project number AiF 16791N. The authors would furthermore like to thank Florian Gschwendtner for excellent assistance and Dr. Jean Titze from Doehler Group for providing the facilities and knowledge for the upscale.